There are certain times in life when you need an advisor — someone that can provide you with counsel. How do you find this type of person that can provide you with this service? Advertising a service can be difficult because you need to drive awareness, influence behavior and develop trust. Ask any person who suddenly needed a lawyer and they’ll tell you that they either received a referral or did a search. In fact, 58% of consumers will use a search to find an attorney or legal service according to FindLaw.com. But searching online can be daunting. Typing “lawyer” into a search engine delivers nearly 900 million results. How can an attorney or legal firm assure that their name is recognized and trusted enough that consumers will seek out their firm over others? Use a medium that is trusted, helps to drive awareness and influence search – radio. Radio reaches 90% of adults whose household has used an attorney in the past year. 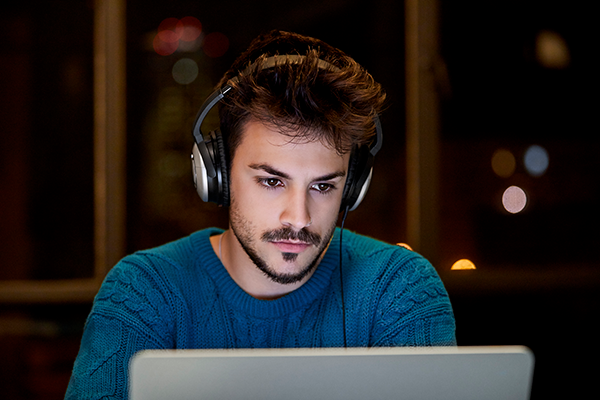 In an analysis of over 102,000 radio ads throughout the 2018 calendar year, radio drove a 5% increase in new user search. 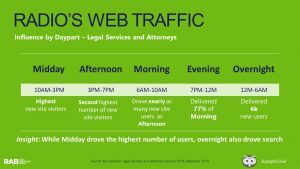 Additionally, 4 out of every 5 people driven to a legal advertiser’s site by radio were new visitors, based on data from NumericOwl. Radio campaigns in the legal services/attorney category delivered, on average, 110 new visitors per day. While activity varied by day, radio ads generated more site visits on Thursdays, followed by Wednesdays – 17,200 and 14,600, respectively. Monday delivered a third of Thursday’s activity – still a significant amount (4,800). Overnight delivered 6,000 new visits – half of Evening. Advertising for a legal firm is different. It’s advertising a service that most people may not think they need, until they suddenly do. Therefore, it’s important to have a medium that delivers a message that resonates with potential clients and influences what they do. If you have ever heard an ad for a service that prompted you to search, what caused the trigger? Next Next post: Radio on Main Street Podcast Featuring Tom Langmyer, President & CEO of Great Lakes Media Corp.